Atelier Cologne fragrances are stacking up. In 2016, they released 10 perfumes, and as of this writing, I count 32 fragrances for sale on their website (that's 32 fragrances released in under SEVEN years). Diptyque has been around almost 60 years and has about the same number of fragrances (not counting discontinuations) as Atelier Cologne. Frédéric Malle (10 years older than Atelier Cologne) has not broken the 30 mark (it sells 26 fragrances). But what a difference! Diptyque and Frédéric Malle sell some sensational, memorable perfumes. Atelier Cologne? Not really. Overall, Atelier Cologne's perfumes don't push boundaries; they're almost twee, especially compared to Diptyque's and Frédéric Malle's wild and varied "wardrobes." Clémentine California was released last year and is a unisex fragrance in the Collection Originale. Its ingredients list sounded promising: clementine, mandarin, juniper, star anise, pepper, basil, vetiver, sandalwood and cypress. Clémentine California opens with juicy clementine/mandarin; what happens next is a very clean mélange of wispy notes: a hint of "green" (could be a combo of "basil" and "vetiver" or whatever chemicals represent them here) and sugary (almost caramel-dipped) citrus peel...and white musk. If this white musk were visible, you'd need sunglasses. Clémentine California's sillage becomes pronounced when its laundry musk arrives. Clémentine California is one of the most basic/least interesting/inexpensive-smelling scents I've encountered from Atelier Cologne...or anyone else; it will probably sell like hot cakes (or should we say hot tamales?) We shouldn't say hot tamales...because Clémentine California has not a thing to do with California. Citron d’Erable ("lemon-maple") is a member of the brand's Collection Azur and once more we are presented with an alluring mix of ingredients: lemon, mandarin, maple syrup accord (with sandalwood), pepper, eucalyptus, black currant, maple wood, sequoia and cedar. Ignore those notes! Citron d'Erable opens and closes with a gourmand aroma of warm, lemon-scented maple syrup, a sweet citrus scent. Though this is a simple (I don't need it) cologne, it did give me ideas: Meyer lemon or grapefruit marmalade flavored with maple syrup and maybe a splash of bourbon. (Could make a nice cocktail, too...with lots of vodka and maybe a drizzle of black tea syrup added to the maple and grapefruit/lemon juice). If you can't wear 'em, eat or drink 'em! Atelier Cologne Clémentine California is currently available in 200 ml ($195); 100 ml ($130) and 30 ml ($75); Citron d'Erable is available in 100 ml ($130) and 30 ml ($85). 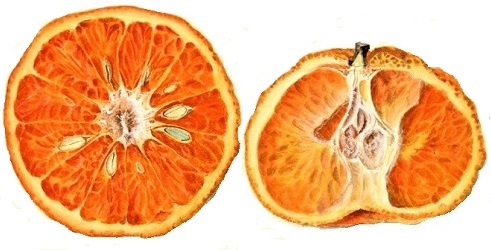 Note: top image of Citrus nobilis via the U.S. Department of Agriculture Pomological Watercolor Collection. Rare and Special Collections, National Agricultural Library, Beltsville, MD 20705. Vanille Insensée is something I own but hardy ever wear. I have a decant from a big bottle that I gave away. None of these sound intriguing to me..
Loves…I know, I will make a promise to self to give it away. I love this review, Kevin. Thank you. Sometimes I hanker for the brands not readily available in Aotearoa-New Zealand, and then I read a review such as this, and end up being rather pleased that I’m not missing out on anything super. I’ve started to feel rather jaded about the brands that are long on puffery and short on delivery. Sounds as though this is one such case. Waterdragon…and long on releases!! Glad you feel better, ha! There are several houses that churn out the scents constantly and I find it annoying. Malle and Dyptique never have released fragrance after fragrance and it is much more interesting and exciting when they do launch a new one. Some of the other lines release 5 and 6 new fragrances at a time. In my opinion it’s overkill. Filomena…I really don’t care much now…not like in the old days of constant perfume lust. They seem completely focused on quantity not originality. If they were priced like Bath & Body Works sprays I might not mind. Since they’re heavily promoted at Sephora I guess the strategy is paying off (literally). Isabella: agree with you…CC is GRIM; all in all, the Ateliers seem to be getting more gourmand as the months pass, too. No love for Vanilla Insensee? Really? Sure, it’s easily wearable and not overly complicated, but it’s such a great vanilla and sometimes you just want something that’s easy and smells good! I think it’s THE Atelier that I would wear all the time, if I owned it. People literally say “mmmm” when I wear it and they hug me. I finished a few samples but haven’t broken down for a bottle yet. I liked the early Ateliers a lot, and I am a HUGE fan of their bar soaps (seriously– they are the best!). I own fb of Oolang Infini and Grand Neroli and have finished 2 decants of Trfle Pur. I like Oolong InfinI and Grad Neroli a lot in concept (those top notes! Oh my!) but never reach for them. I keep saying I should swap them. The newer Ateliers were mostly meh to me, at best. And they are multiplying like bunnies!! I think the first 8 or so we’re the best by far. I agree, their first couple collections were wonderful — simple but high-quality, wearble, unembarrassing, and at good prices for the small sizes. It’s a shame they’ve attenuated the line with so many overly similar new releases and higher-priced fragrances. Melissa – I agree. The first groups were really good, especially the top notes. And we don’t disparage the Guerlain colognes or Chanel eau de cologne for being mostly top notes that fade, right? I haven’t kept up, and maybe it’s just that they tried to expand into other notes that really weren’t the core of what was go great about the top notes of the first ones (which were so juicy and succulent as to be surreal). gville: yes, I LOVE the soaps! Not being a citrus or cologne fan, the vast majority of this brand doesn’t interest me. I do like two of their heavier more perfumey scents, Silver Iris and Blanche Immortelle, and Tobacco Nuit was okay. Need to sniff Philtre Ceylon. cazaubon: I do think Philtre Ceylan is one of the best of the line…do try it. Just fanning myself after rereading your Philtre Ceylan review, Kevin! “How did this pair of distressed leather jeans make it into Atelier Cologne’s collection”? What time did I get home last night, and who’s that in the shower?! ???? Ha! That line got my attention too! Kevin’s Philtre Ceylan review is priceless – I’m a bit surprised he got it past Robin. MM, it reminds me of a super-cheap hand sanitizer I encountered at the hospital. At some point I realized almost every AC makes me slightly queasy, but good to know I am not missing anything with these new ones. Not that I was too worried. I hope your nose meets something happier to report on soon, Kevin! I tried only a few Ateliers, but was not very impressed. (jasmin/angelica, an iris centred one, and one with ceder and citrus (forgot the name). If only they were in the same price range of say, Yves Rocher or TBS, I’d consider a bottle. I tried a few in real life at Fumerie and was unimpressed- but then I was impressed at the price! Yeesh! This is a line that I am thoroughly unimpressed with. 4711 does similar things with their colognes and they are super affordable- you can buy huge bottles at Latin American/Caribbean stores and splash away without spending more than $20. You can get 4711 in all sorts of fresh fragrances, like blood orange and thyme and such. I agree that the soaps are nice, if so huge they make me feel like I have tiny child hands. Orange Sanguine makes me happy for the Demeter-like length of time it lasts, but after the first couple they really became banal, to put it bluntly. Clementine California sounds pretty dreadful. I have Vanille Insensee and Rose Anonyme in travel spray size and like both of them, but only enough to buy that amount. I also like Jasmin Angelique but probably wouldn’t bother buying unless that one came in a travel spray too (don’t think it does). I see it is almost fashionable to diss /criticise the brand. But they do something really well- casual, every day scents. When I go to work, I can’t unfortunately wear dragon’s breath or deep, niche ouds. 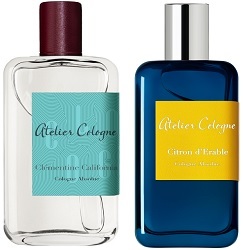 Atelier Cologne, while not revolutionary, does just fine. And Orange Sanguine and Pomelo Paradis are gorgeous.